Canadian Prime Minister Stephen Harper has announced travel bans and economic sanctions against Russian and Ukrainian officials the government believes are responsible for the ongoing crisis in Ukraine. The list of individuals includes several close aides to Russian President Vladimir Putin and the deputy prime minister of Russia, Dmitry Olegovich Rogozin, as well as multiple Crimean officials. “The individuals targeted are responsible for undermining the sovereignty and territorial integrity of Ukraine and for facilitating Russian military action against Ukraine," the Canadian government said in a press release Monday. Harper made the announcement following an afternoon meeting with Vadym Prystaiko, Ukraine’s ambassador to Canada. Harper himself is set to travel to Kyiv on Friday to show his support for the new interim government. Earlier Monday, U.S. President Barack Obama announced the most comprehensive sanctions against Russia since the Cold War and the EU slapped travel bans and asset freezes on 21 people from Russia and Crimea linked to the push for the secession of Ukraine’s strategic Black Sea peninsula. The sanctions came hours after Crimea's parliament officially declared the region an independent state, following its residents' overwhelming vote Sunday to break away from Ukraine and seek to join Russia. In the hours following the declaration, Putin signed a decree in Russia recognizing Crimea as a "sovereign and independent country." The decree, which was posted on the Kremlin's website and took effect immediately, appeared to be a first step toward integrating Crimea as a part of the Russian Federation. On Tuesday, Putin will address a special joint session of Russia's State Duma which could make a decision on annexation of the majority ethnic-Russian region. Obama, speaking in Washington, said the U.S. stands firmly behind Ukraine and that he’s willing to “increase the cost” to Russia if it doesn’t de-escalate the situation. “We're making it clear that there are consequences for their actions," Obama said. Announcement of the sanctions and Obama's statement were dismissed by many of the Russian officials against which the sanctions have been levied. Rogozin tweeted on Monday afternoon, "I think the decree of the president of the United States was written by some joker," and Russian Deputy Foreign Minister Sergei Ryabkov declared that they were "a reflection of a pathological unwillingness to acknowledge reality and a desire to impose on everyone one-sided and unbalanced approaches that absolutely ignore reality." In Brussels, the EU also voted to approve sanctions against Russia. "We need to show solidarity with Ukraine and therefore Russia leaves us no choice," Polish Foreign Minister Radoslaw Sikorski told reporters in Brussels. "The 'Anschluss' of Crimea cannot rest without a response from the international community," he said, referring to Nazi Germany's forceful annexation of Austria. Neither the U.S. nor EU recognizes the results of Crimea’s referendum on Sunday, calling it illegitimate and unconstitutional. Obama said the sanctions are aimed directly at those trying to undermine Ukraine. Administration officials, speaking to reporters on a conference call on the condition they not be quoted by name, said the sanctions are meant to “hit close to home” for Russian President Vladimir Putin. During his brief speech, Obama stressed that the government has the authority to go after officials in the Russian arms sector and those who support Russian cronies if the government doesn't pursue a diplomatic solution to the crisis in Ukraine. He’s calling on Russia to remove its soldiers from Ukraine, allow international observers into the country and begin a dialogue with the new interim Ukrainian government. Obama told Putin on Sunday the Crimean vote "would never be recognized" by the United States, as he and other top U.S. officials warned Moscow against making further military moves toward southern and eastern Ukraine. In Simferopol, Crimea’s regional capital, crowds draped in Russian flags danced late into the night. Those same white, blue and red colours were immediately hung from government buildings, even though it’s still unclear how Russia plans to govern Crimea. “They wasted no time,” the CBC’s Derek Stoffel reports from Simferopol. Nearly 97 per cent of voters supported joining Russia in the final count of Sunday's referendum results, a Crimean election chief said. Mikhail Malyshev said the final tally was 96.8 per cent in favour of leaving Ukraine. The referendum has plunged East-West relations to lows not seen since the Cold War. Putin has said he will respect the will of the people in Crimea. "The results of the referendum in Crimea clearly showed that residents of Crimea see their future only as part of Russia," the deputy speaker of the State Duma, Sergei Neverov, was quoted as saying. Duma officials say the Black Sea peninsula can become a member of the Russian Federation under current legislation, specifically under a law "on the procedure for the adoption into the Russian Federation and education of new subjects of the Russian Federation" that was passed in 2001, Interfax said. “It’s a question of is it going to happen this week or next?” he told CBC News Network. What the next phase of Russian aggression will look like is unclear, Wynnyckyj said, but many believe Putin will try to cut Ukraine off from the Black Sea by taking over Odesa. Wynnyckyj said he’s doubtful Russian troops could make it to Kyiv, but it’s unlikely Ukraine’s forces — bolstered by around 20,000 reservists contacted Monday — could prevent a “mass-scale violation of territorial integrity” by Russia. 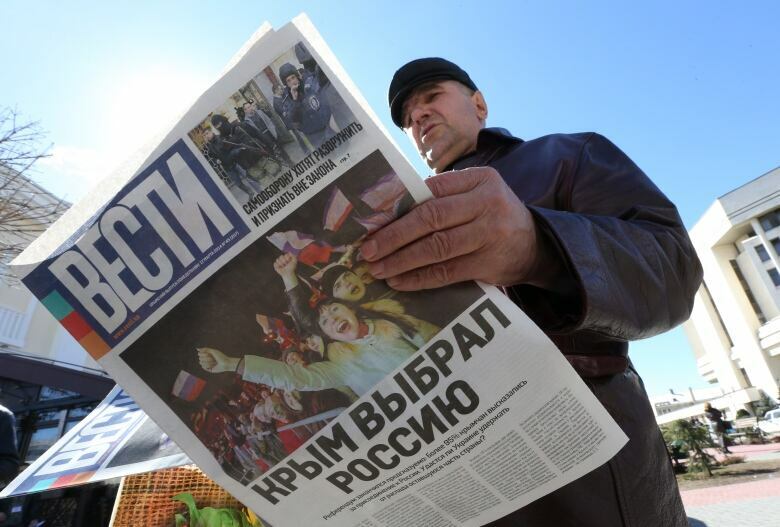 First Crimea's appeal to join Russia will be sent to Putin. If approved, Putin will then pass it to the upper and lower houses of parliament, which will work on a treaty to be signed between Russia and the new state. Following its signing, Russia's constitutional court should then verify the treaty. It should then be voted on by both houses of parliament — the Duma and the Federation Council. "I do not think there will be any delays in considering these questions in either the State Duma or Federation Council. We are ready to pass all the required legal decisions as quickly as possible," the Federation Council's deputy speaker, Ilyas Umakhanov, told Rossiya-24 television. Russia's lower house of parliament will pass legislation allowing Ukraine's southern Crimea region to join Russia "in the very near future", news agency Interfax cited its deputy speaker as saying. Ukraine's Crimean Peninsula is also taking steps to integrate its financial system with Russia's — including adopting the ruble currency. Russia will send Crimea 1 billion rubles, about $30 million, "in the coming days" to help it stabilize its financial situation, the Interfax news agency reported on Monday. A separate Crimean decree named the Russian ruble as an official currency, though people there can continue using the Ukrainian hryvnia as well through 2015. Eastern Ukraine has become the new area of concern. Russian forces have been massing near the border, and many are speculating it, too, could be taken over. “Certainly that is the big worry,” Stoffel said. Ukraine’s new government is in talks with Russia — “I think it’s fair to say they’re going to try and keep the tension down,” Stoffel reported — but it’s unclear when, or if, Russian troops will pull back. Meanwhile, Ukraine’s parliament passed a presidential order to mobilize over 20,000 volunteers with prior military experience. The reservists are set to join a 20,000-strong national guard, though Russia still has far more troops and military firepower. In Crimea, Stoffel reports that Ukrainian soldiers have been offered posts in the Russian military, but most have refused. 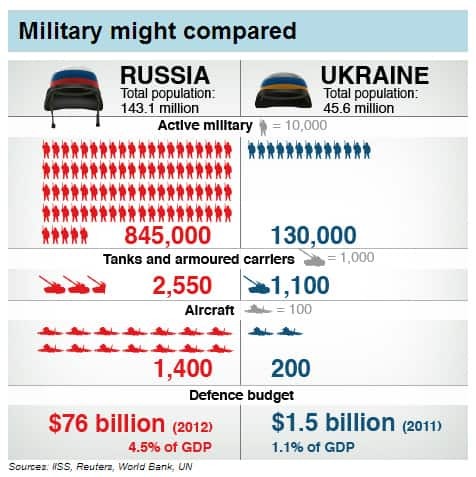 Russia’s military dwarfs Ukraine's.